Antique radios are relics of yester-year that continue to charm and amaze. Let’s say you’ve been rummaging through the attic of an older relative and stumbled across a plain-coloured box-shaped item complete with built-in speaker and dial. Congratulations, you’ve just stumbled upon an antique radio. These marvels of technology were the first mass-communication device, piping in dramas, music and vital news and information into homes before the dawn of tube televisions. Looking the still-working marvel over, you begin to wonder if you’ve stumbled on a true rarity from another era. But how do you check if this is in fact the case? Some Internet sleuthing, of course, with the help of these tips from vintage radio guru Phil Nelson. The manufacture’s name and model number is like the given name and surname of a radio – it tells you what family it came from, and gives you a unique identity for it. There is no uniform template for model numbers, but most radios have model numbers between two to six characters long with both numbers and letters. The model number is most often found on a paper label affixed to the radio cabinet or printed on the cabinet itself, and can carry other information including serial number and tube diagram. Serial numbers aren’t too helpful for identification, and neither is the patent number found on some radios, which says only when the maker filed for the patent, not when the radio was in fact made. What’s more, some antique radios even carry a product name. 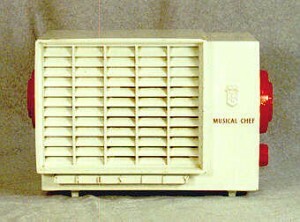 This Crosley F5-TWE was dubbed the “Musical Chef” (chopping up and serving the airwaves) and the name is printed right there on the front of the unit. Obviously the next step is to load up your web browser and start searching using the manufacturer name and model number. Odds are this will yield the information you need. But, as hard is it is to believe, not all the world’s information is on the Internet (yet). If you can’t dig up any sources, consider tracking down a vintage radio collector’s book. A list of several of them (complete with ISBN numbers) can be found here. You don’t need to buy these books – they may be available in your local library. If those tactics don’t work, you can consult a radio collectors club (see a list here and scroll down for Canada). Using these research techniques should yield a biography-worth of information on your new found radio, as well as what price it may fetch at auction. Even if you don’t want to sell it, you’ll have enough to tell a lengthy story to friends and family about your discovery.